People love going to music festivals with their friends. Why is man’s best friend not allowed at these festivals? 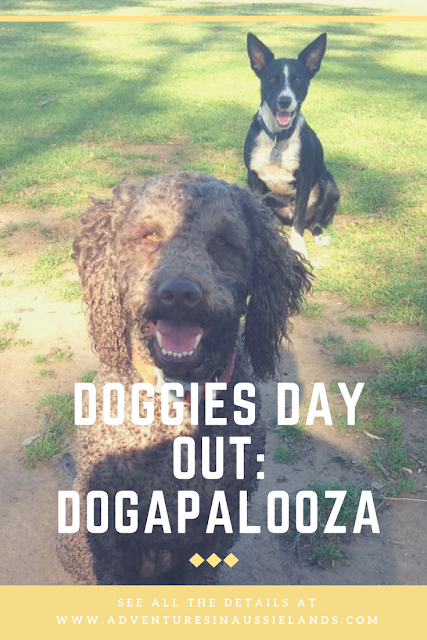 Today at Dogapalooza, they were. Whoever came up with this idea was absolutely brilliant! There were a variety of bands, food stalls, and doggy goods for purchase. All of the proceeds from the event went to various animal rescue centres around Victoria. 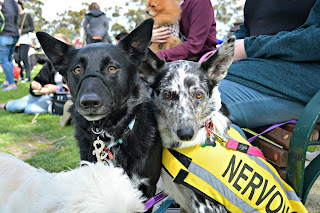 Plus there were so many doggos there! Archer was in doggy heaven (as I’m sure most puppers were). 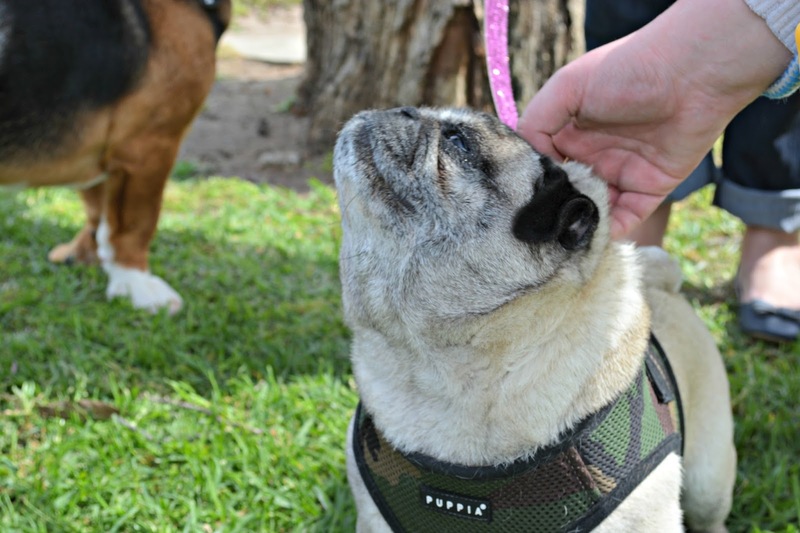 The event went from 11-5pm and offered a variety of areas for the pups. There was a specific, sectioned off-lead area where the pups could run around and make heaps of friends. Archer, being the social dog that he is, ran around making friends with everyone. He played fetch with two gorgeous Weimaraners, ran laps with a few Kelpies and Border Collies, and wrestled with a German Shepherd. 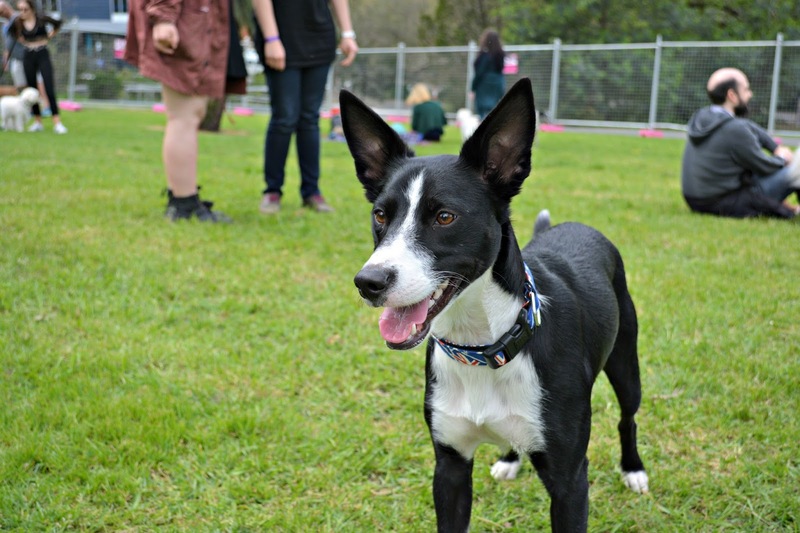 During the festival, various dog “bests” were announced. Archer got dressed up in his best Aussie bow tie for the Best Rescue Dog (Male) category. Unfortunately, Archer did not win in his category, but he still had an excellent time saying high to all his new friends and getting pats from people in the audience. Walking towards the main stage, there were various food stalls for both people and dogs. The lines were incredibly long, and I heard that one person had waited one hour for their mushroom burger. I decided to skip on the food because that just seemed outrageous to me. Hopefully next year there will be more food stalls so the lines aren’t so crazy. 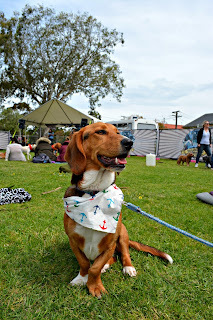 There were also food stalls for the doggies. Archer and a few of his doggie friends got incredibly spoiled when one of the stands came around with some treats for them. It was incredibly impressive that all the bands volunteered their time for the event. There were some incredible Australian artists (most I had not had the pleasure of hearing before). 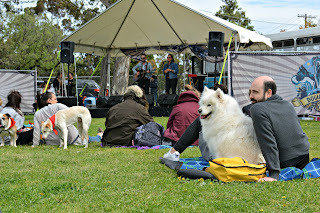 Many doggies and their parents came with blankets and picnic baskets to sit and enjoy the entertainment. Most dogs lay comfortably next to their people, Archer...not so much. He wanted everyone to give him pats, and he wanted every dog to play. He spent the day wrestling with his friend Rigby and other pups who sat within our vicinity. It was an incredibly fun filled day for both myself and Archer. It may have been incredibly windy, various tents may have toppled over, bands may have had to postpone their sets, but overall it was incredibly lovely. 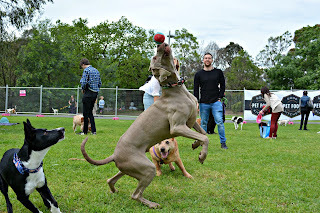 It was so lovely to be able to see all the dogs playing with one another. Archer had the time of his puppy life and cannot wait to play with his new friends again. But my 2 year old Mini Aussie would love it!! I must say since I've been reading your blog, I just never new how amazing and fun Australia could be!! Thank you for doing this on RABADABA and letting me learn about your blog and Australia!! You rock just like #Rabadaba!